Thursday September 13th 1883 I was over town with Rob in the buggy in the morning and John Stinsons family were here for dinner. Mother went to the fair with them in the afternoon. I was busy about the work and got the supper ready. Friday September 14th 1883 I was busy about the work all the forenoon. Soon after dinner the folks all went to the fair. Mother took May along I was sewing in the afternoon on my dress It was late when the folks got home to supper. Weather threatening rain. 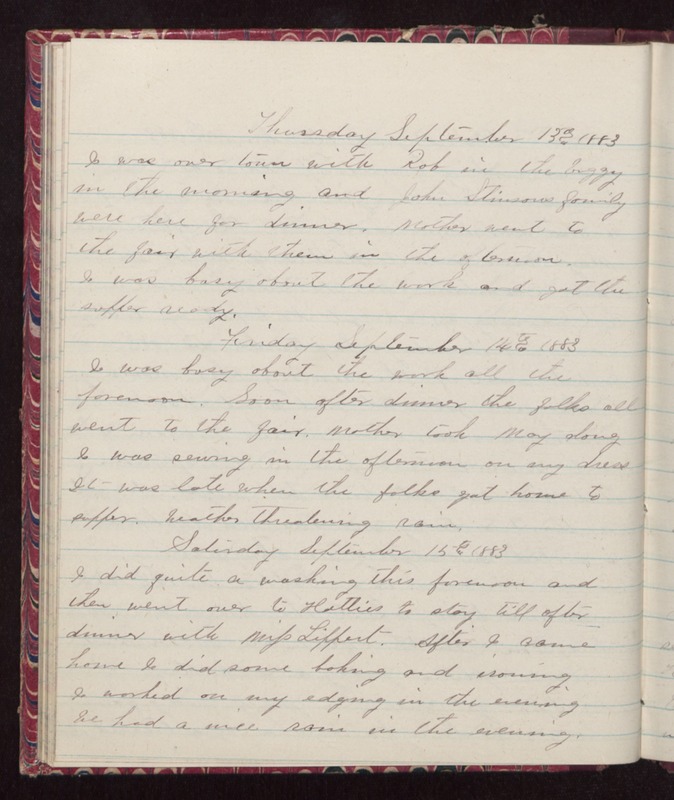 Saturday September 15th 1883 I did quite a washing this forenoon and then went over to Hatties to stay till after dinner with Miss Lippert. After I came home I did some baking and ironing I worked on my edging in the evening We had a nice rain in the evening.